To leave a new message on the Guestbook, please click the ‘Write a new entry‘ button below. You can also make any other comments/questions etc. via the Contact page. For security reasons we save the IP address 91.236.74.30. Cindy Shann. I haven’t looked at the Trimdon site for quite a while , I have just read your post. Yes there was an ice cream parlour in the middle of front street Trimdon Grange, can’t remember the name but they sold Santi’s ice cream who had a shop in Fishburn. I don’t know how many people will remember Santi coming around the houses with a cart selling ice cream in the late 1930s early 40s.. Their ice cream was delicious. How many people remember the co-op burning down in the late 30s ? I would just like to give credit where credit is due, as we all know it is so easy to pick fault. Trimdon Colliery and Deaf Hill has looked fantastic this summer. The flowers were spectacular. Well done Parish Council and to everyone involved, you have really turned this lovely village around.... keep up the great work. Bill Ramage. Hi David, great news about the bottle digging, we miss doing that. I have a few Scottish wiskey jugs from antique stores and a few prized bottles we took with us. Also a 2 gallon wine flagon, blue slip decoration and wine merchants name ect incised, rar e and valuable. Yes we are enjoying retirment, at 67 I was getting too old to be crawling around the inside of submarines. Catch up with us on facebook. Best of luck with the bottles. G.
Hi Cindy, It was Greenwells, Sweets and Ice cream and then a postal outlet. I was reminiscing re something I saw on the Beamish website the other day. Does anyone remember a kind of ice cream parlour place down in the middle of the Front Street in Trimdon Grange? It would have been in the mid to late 50's and I think the shop was turned into Greenwalds? grocery shop. I thought I remembered going in there with me mam and dad. Hi Pat, thank you very much for getting in touch!Yes they do I visit quite often. They are buried next to my uncle Derek. Anty Greathead has a great grandaughter Alice Grace Robson Born 8th May 2018. Andrew Butler, I am pretty sure Thomas and Ida Butler have a headstone near my Father in Trimdon Grange Cemetery...I can check this for you if you wish. Hi Andrew. Derek died when he was 58 years old. His sister Hilder married Doug Chaytor and they live at High Shincliffe near Durham. GO on Amazon and look for a book called Its not always dark at 7 o'clock.It was written by Doug and it tells when Derek died and how.A must read book. Good luck with your family tree. Hi, I'm looking for information for my family tree. My uncle was Derek Butler, auntie Hilda Chaytor (nee Butler) and their parents were Thomas and Ida Butler. Any information or pictures would be gratefully appreciated! Thank you. 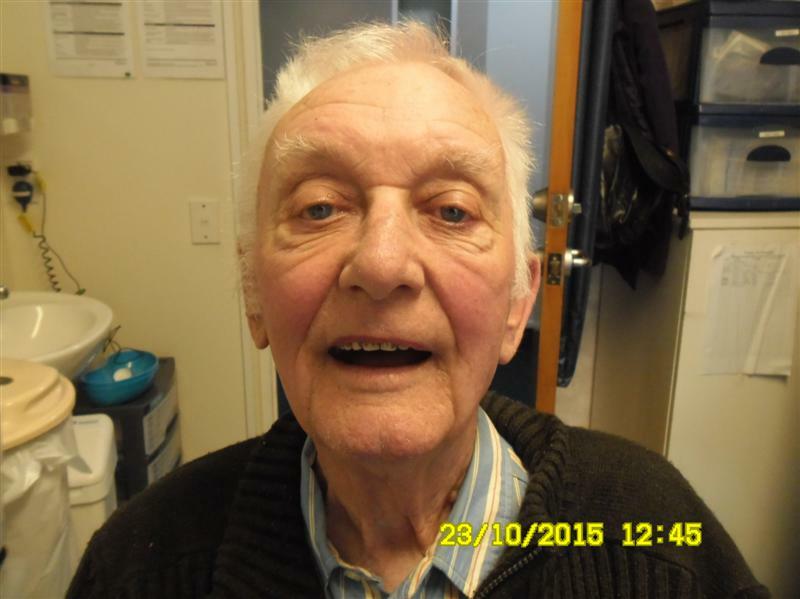 On the 16th December Mr Anthony ( Anty ) Greathead will be 102. Is he the oldest surviving miner in Co. Durham/the UK?. Message: Can someone tell me why Robert Libby posted his illiterate message in 2015? He has spent so much time in prison for burglary, drugs, petty crime etc. Also he was the father of numerous children with Alison. Yet another who denies dragging down this area. BTW he scratched and keyed my car and others in Trimdon. Message: 1905 street names – Hi, does anyone know if there was a Clark street in Trimdon in 1905? and also a Pit Street in the same year. I cant find either of these streets on any old maps I have viewed. Message: I have visited twice and found the area very run down apart from Sedgefield. I saw much dependence on the benefits system and some residents more than happy to rely on them. Plus young adults idling around dealing drugs, into petty crime and impregnating young girls, so many with babies and toddlers. It is time this community took some pride and raised the standards. I won’t visit again as this area was a most proud environment due to mining but now a sink hole. Message: Hi,I lived in Trimdon village Dunelm Road, was married in the village church in 1968. I would love to hear from friends that might remember me.My Maiden name was Ireland. Message: Could anyone tell me where in Trimdon Grange William Street was situated? I was born there but have been unable to find any pictures of it. Message: Hi Sonia , it’s George, Anne will be delighted to hear from you. We are on facebook too. Talk soon. Message: Just looking at the Bull family photo’s on the Trimdon Times Galleries. I remember Olwyn and Penny from school, they were very cute girls. George Robson Victoria BC, Canada. Message: Cinnamon Drive, Trimdon Station is the worst place to live. The people are middle class wannabes with no class standards. The children are allowed to on mass hang around like thugs. They are rude, disrespectful and if they reflect the family and school standards of the area are appalling. Children regularly eat on the streets, leave litter, ride bikes without helmets across roads without any sign of road sense. The language is appalling and the general loudness and inappropriateness. They play on private drives that are not there’s, throw balls, stones, bottles; climb fences, kick balls at each other, cars, animals etc. The parents are tucked up inside their houses with no idea of what their children are up to and if are approached about issues have public screaming matches. The area has plenty of local walks, parks and spaces that parents could utilise however the parents can’t seem to be bothered and allow these children to be a nuisance. Presently a child is walking around he whole estate blowing an instrument at people and as loud as she can! I feel for any poor night worker of families with young children. No regard for socially acceptable behaviour. Such a shame. Message: Just a little reply to the cinnamon drive post, it’s lovely to see the kids playing together and the fact that 3 playing for the village brass bands explain the instruments, I can’t believe the keep off the shale graffiti hasn’t been mentioned though. Message: In response to the Cinnamon Drive post, I must vehemently refute what was said! Cinnamon drive is such a lovely, friendly and very welcoming estate. It is filled with families who are aspiring to show the young that working hard in life is important; I see young female professionals going to work each day, as well as their male counterparts, showing their children that working hard is something to aspire to. Yes, children play in the estate. Of course they do, and what a joy that sight is to behold! Very reminiscent of my youth, too, and a happy one at that. The person who has written the derogatory comments about this estate appears to be a very bitter and sad person who seems to lack joy and all things good in their life! Cinnamon Drive – a lovely place to be! Message: Again in reply to the opinionated person regarding Cinnamon Drive. Worst place to live in Trimdon??? Really?? The children that have been mentioned in the post all live on the estate so have a reason for being there, the RESPONSIBLE parents are those who allow their children to play on the estate close to their homes so contrary to the original post, we DO all know exactly where our children are, they do not roam the streets “like thugs” and are in a safe environment playing outside their own doors, children being children and playing together! The children do play football and play on their bikes getting fresh air and exercise rather than being indoors and they have good friendships amongst their peers and neighbours, all which promotes a nice area to live and for them to grow up in- where families work for nice homes and good examples are set. As for appalling family and school standards, the original poster must not know the children at all as each one is well educated, hard working, high achieving and are excellent examples of today’s modern child. Hopefully all the children will grow up to be successful, well rounded individuals with fond childhood memories. It seems the original poster has themselves no desire to be a part of the friendly estate and has a lack of understanding when it comes to parenting. No “public screaming match” is needed should any issues regarding my children arise… I’d be happy to discuss the delusional ideas and slanderous remarks about the children and residents -no problem! Message: I feel compelled to respond to the post by Grace Tunny as I am utterly disgusted that someone can be so judgemental and criticising of people they do not know. I live in Cinnamon Drive and am dumbfounded at the description of the children and indeed their parents! I am only able to comment on the people and children that I know but parents are hardworking and strive to show an example to their children in that with dedication and a positive work ethic they can achieve well. Children are children and should be allowed to be such and be able to play in the local area which is safe and where parents can keep a close eye; a priority for parents in this day and age with the safety issues that face our children. Over the summer it has been a pleasure to see the children all playing together; just like I did when I was that age. I must also stress that I, nor the people I know in the estate, are middle class wannabes. My husband and I are simply hardworking people who strive to provide the best we can for our daughter. I must say Grace, if indeed this is your name, that you appear to be a very sad individual who has a sole aim in life which is to try and destroy the happiness of others. Message: Having left Trimdon many years ago I recently found out about the publication of the Trimdon Times. I brought it up online and had a lot of pleasure looking through the various files but when I reached the old school photos section I was amazed to see myself in the middle of the Trimdon Grange Infants School photo, 1952 or 1953. I don’t know if its possible, but if so, I’d love a copy of the photo. I’m guessing the lady who submitted it was originally called Elizabeth Jordon who was in the same class. I’ll certainly keep dipping into the publication now. Message: Keith Rennie asked about Doreen Scott, Trimdon Village. Doreen is my cousin on my dads side (Wardell) she did live in what’s is known as Hillcrest, Trimdon Village when she was living at home with her parents Wilf and Maggie Scott, Maggie was my aunt. Doreen had two brothers George who had the Butchers business in Triimdon Village and Kelloe where he lived and still does,, and Alan who lives in Trimdon Village. All three now in their 70’s. Doreen is now called Smith and lives in Newton Aycliffe. Message: Does anyone have photo’s of a small grocery shop that was at 2 Commercial Street? It is now a florists. I use this website myself,and it is the most comprehensive site on the web (and cheapest)for researching your Co.Durham families. Good luck in your searching! Message: My Great Grandfather Albert John Elvin died in WW1 aged 33. He lived at 4 Dunston St Trimdon Colliery. Married to Jeanie Hartforth Elvin. He was the son of Albert George and Sarah Elvin. Any information please? Message: Albert John Elvin is also my grandfather. My grandfather Albert John Elvin and I must have some cousins etc! Anyone with info would be appreciated, any relatives of Albert John Elvin please get in touch. Message: Thank you for the information regarding my Great Grandad Albert John Elvin. I have seen the memorial with his name on it on the Trimdon Times remembrance photos 2014. My granddad Benjamin Whitley Scott Elvin (Alberts son)came to London as he didn’t want to work down the pits. He was a very successful businessman had his own removals company moving people overseas to Australia, South Africa etc. My granddad died in 1981 of cancer. I wonder how many Elvins are still in Trimdon. Very moving seeing Alberts name on the memorial. I know where his war grave is in France. Grandad never spoke much about his family he was only 3 when his dad died so never knew him. So sad. Message: I believe that Albert John Elvin was the son of George Albert Elvinand Sarah Terrington, married 1884 Gateshead. I believe they had aboutsix children, 1901 Census shows: Albert John, Ann Elizabeth, George,Samuel, Walter and Evelyn.. George Albert was previously married toMary Weldon, 1879 Tynemouth. George and Mary had a daughter Elizabeth Hannah born in 1880. Elizabeth Hannah married John Morgan in 1889 who were the grandparents of Doris Morgan. Elizabeth Hannah re-married in1942 to David Simms. There is a picture of Elizabeth Hannah and David Simms and a story by Doris Morgan on the Trimdon Times website. Message: Hello John Robinson. I don’t visit the T.T. Site very often and I was pleased to see that you are still contributing information. I still live in France and am reasonably fit and well as is my husband, now in our 80s. I hope you and your wife are also OK. Best. Wishes. Mildred. Witnesses: Anna E. Elvin, Alexander Bruce Scott. Message: I lived in the Cemetery House in Deaf Hill from 1960 – 1966/67. I can still remember the happy times there as a child. Message: I am looking for any information about my grandfather, Henry Stone who was living in Cooperative terrace Trimdon at the time of the 1911 census. He was a shot firer and presumably worked in one of the local pits. Any information would be much appreciated. 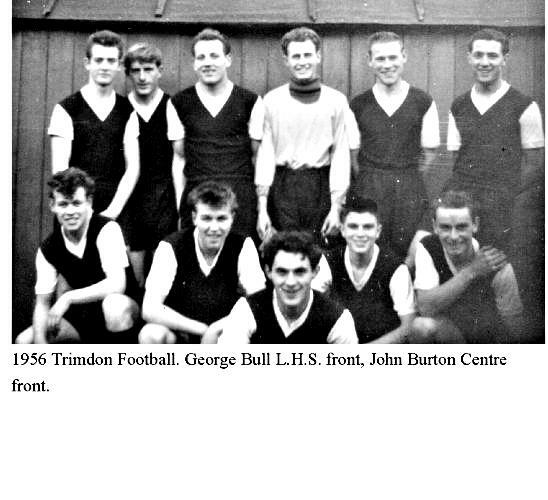 Message: Has anyone got a photo of the 1948/49 Trimdon Grange School Football Team? Message: The fire station was the last building on left as you left the Colliery heading for the Grange,it then became a cinema and shared its films with the Grange picture picture house,local youths used to cycle between the two ferrying the reels of film. It was also the first start point for Jack Pauls DLI Engineering. Message: I seem to remember a fire station in the yard of what was the Coop Store.This was just up the street from where the old school is situated,I can`t think of anywhere else it could be. Message: Hi. can anyone remember the fire station in Trimdon Grange? Bobby, Sedgefield.